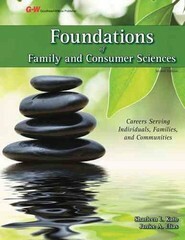 Foundations of Family and Consumer Sciences 2 Edition Foundations of Family and Consumer Sciences a completely updated college-level textbook designed to introduce students to the Family and Consumer Sciences profession. An overview of the profession, including history and trends, is presented. Career opportunities for each Family and Consumer Sciences specialization area are explored and come to life in Professional Profiles and Issues in the News features. The text guides students in how to move into the workplace and make a difference in the lives of others.